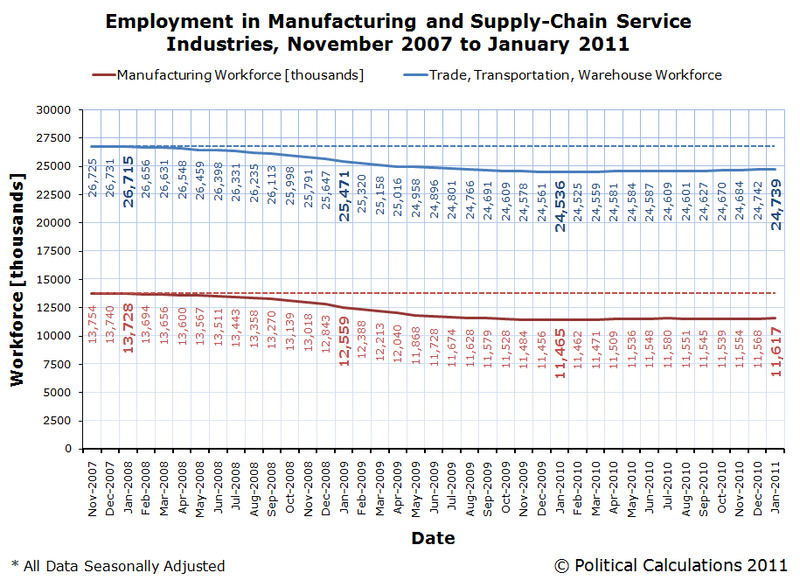 In the six months from August 2008 through January 2009, the bottom dropped out of the U.S. automotive industry. It was an economic crisis that had been building behind the scenes in Detroit, the centre of the industry, for many years. Here, U.S. automakers had enjoyed many years of seeming success as they progressively increased their relative production of Sport Utility Vehicles (SUVs) given the much higher profit they could earn from producing and selling these kinds of vehicles compared to others in the years leading up to the crisis. The large profits for SUVs were substantial enough to make the automakers profitable overall, but their seeming success masked a growing problem. The costs of sustaining a large workforce and the benefits of an even larger retired workforce were became too great for the companies to withstand. The companies had pursued making more and more SUVs to overcome the gap, which they could only do while the large, fuel-hungry vehicles were popular with the public. The popularity of SUVs dramatically changed in 2008, thanks to a major spike in oil prices during the summer, which sent average gasoline prices in the U.S. up over $4.00 per gallon in June and July. U.S. automakers quickly found themselves making way too many of the wrong kinds of vehicles for that consumer climate and by August 2008, they could no longer continue business as usual. Truly massive layoffs erupted across the industry, beginning with the lowest level manufacturers and the companies that support the industry’s supply chains, which rapidly spread upward through the production chain to reaching its topmost producers. And as you can see from the chart below showing the number of people counted as working in either the Manufacturing sector or the Trade, Transportation and Warehousing (aka “Supply Chain Services”) from the BLS’ Current Employment Statistics survey from November 2007 through January 2011, the vast majority of those jobs lost at that time have not been recovered. 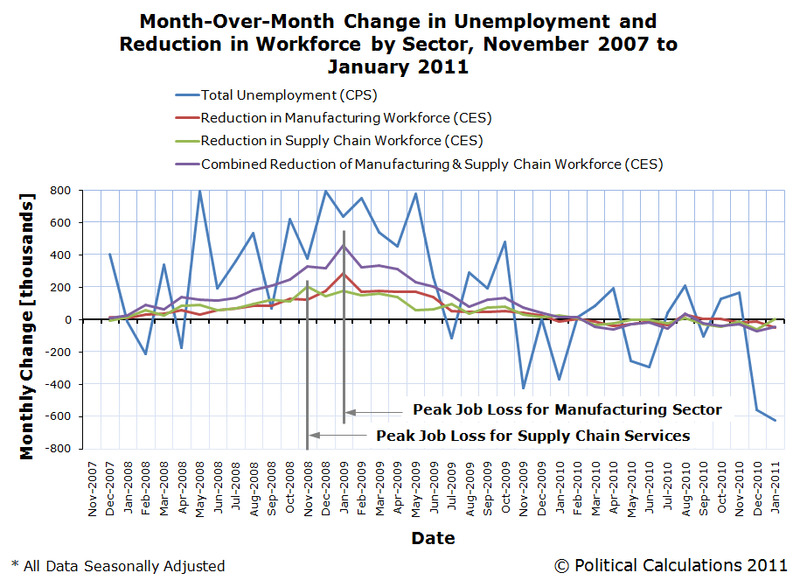 As you can see from the chart below showing the size of the month-over-month reductions in these sectors, combined with the change in the number of people counted as being unemployed from the U.S. Census’ and BLS’ Current Population Survey, those job losses peaked in these sectors from November 2008 through January 2009. With so many people being displaced from the U.S. workforce, the U.S. Congress acted several times to extend the period in which people laid off from their jobs could be eligible to receive unemployment insurance benefits. In November 2008, they acted to provide unemployment insurance benefits for as long as 59 weeks. A year later, they acted to add an additional 20 weeks of unemployment benefits, bringing the total period of eligibility up to 79 weeks for the most economically distressed states. Four months later, that was increased to 99 weeks. In the past, including last month, when the unemployment rate has dropped that was because of a big drop off in the number of people looking for work. In government logic, fewer people looking for work means fewer people who are unemployed. (You have to be looking to be counted.) And you are likely to hear this explanation from some people again, as they tell you to ignore the drop in the unemployment rate. But they are wrong. That didn’t happen this time. At first look, it does appear like just over 500,000 people stopped looking for work in January. But the labour department economists say that drop is only because of essentially an error in last year’s numbers. The labour Department was overcounting the number of workers who were in the workforce a year ago. Factor out that statistical rebalancing, which happens annually, and the number of people looking for work was the same. Yet, the number of people who were unemployed dropped by 600,000. Now, think about which unemployed people were being statistically “overcounted”. Could it be the people with the unique skills needed to support the U.S. automotive industry, who lack any meaningful prospect of returning to work in their former industry and who also lack the skills needed to go into other fields that are already well staffed? If the peak in their displacement from the U.S. workforce occurred between November 2008 and January 2009, at what point in time would large numbers of these individuals run of of their unemployment benefits, so they could no longer be counted as being unemployed? It seems that everything lines up really nicely! 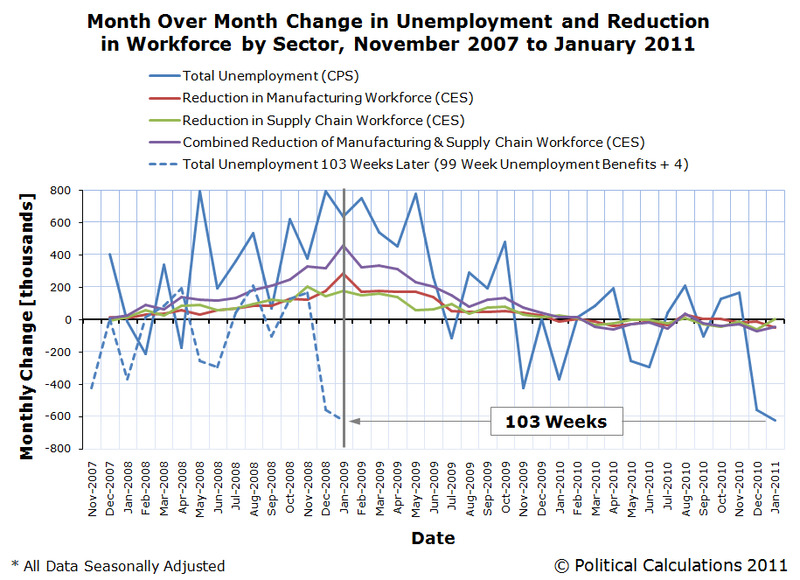 This alignment suggests that the change in the level of unemployment in both December 2010 and January 2011 is a direct result of the expiration of the extended jobless benefits for people now permanently displaced from their occupations when the bottom dropped out of the automotive industry in the last few months of 2008 and early in 2009. These individuals now no longer need to claim they are seeking work to be able to continue receiving jobless benefits, because they can’t collect any more, and as a result, they’re also no longer being counted as being unemployed. For the Obama administration’s labour Department, those are people who for the last year should never have been counted as having any inclination of finding new work and for whom the unemployment data now needs to be “statistically adjusted” to account for their lack of real employment prospects. Oh, the inconvenience! As a final note, with so many displaced workers now moving past their 99 weeks worth of unemployment benefits, we would hypothesize that we will see a significant uptick in the number of people who are counted as being self-employed, which will coincide with the apparently positive changes we’re seeing in the unemployment rate. That change would show up in the household jobs survey (the Current Population Survey), but not in the establishment jobs survey (the Current Employment Statistics survey). Our thinking is that it’s not that their economic situation has suddenly become so much brighter or that people are becoming more entrepreneurial because they recognise many more new opportunities, so much as it’s what they’re doing to just get by until it really does.